Lady Drive Her offers reliable transportation to the Halifax airport. We will drop you off or pick you up and take you to the Halifax airport from anywhere in the HRM. To book a drop-off and/or pick fill out the form on this page or contact us for the prompt, reliable transportation to the Halifax airport from one of our courteous female drivers. When you need to get to the local airport or get from the airport to the city center, hotels, or other locations, count on our efficient and comfortable airport shuttle service in Halifax, NS. Several years ago, the owner of Lady Drive Her realized that there was a noticeable need for female taxi and shuttle drivers in the area. Our company does not employ our drivers; we merely help connect passengers looking for female drivers with female drivers who are self-employed or working for other companies. When you need a taxi to Halifax airport, reach out to our staff to find a comfortable and timely ride wherever you need to go. Traveling is stressful enough without having to worry about finding transportation to and from the airport. When you’re searching for a shuttle service, let us take the stress out of the decision. Whether you prefer a female driver because you feel more comfortable or because you trust that our shuttles are of the highest quality, you can count on us to get you to your destination on time and in style. Whether you’re arriving in Halifax for business or pleasure or you’re traveling out of the Halifax airport, it’s important to start or end your trip in comfort. Rather than trying to catch a taxi at the airport or struggling with the city’s public transportation system, reach out to our staff. We’ll find an experienced and dedicated shuttle driver to pick you up on time and drive you to your destination in a comfortable vehicle. Many passengers prefer traveling with female drivers for a variety of reasons. We noticed the high number of requests for female drivers and how difficult it was to fulfill this need for our clients, so we started Lady Drive Her to create a database of female drivers in the area, either self-employed or working for other transportation companies. When you need an airport limo service that is on time and makes you feel safe, count on us. We offer shuttle service to numerous hotels and locations throughout the area at great rates. Contact us when you need on-time and stress-free transportation to the Halifax airport. We proudly serve clients throughout the Halifax, Nova Scotia, area! Lady Drive Her provides airport taxi service in Halifax, NS and the surrounding areas. We are a group of experienced, professional ladies providing prompt, reliable service in the HRM. We offer pre-arranged airport transportation service in Halifax, NS, to and from the Halifax Stanfield International Airport. All of our drivers are highly experienced drivers in the area and have been in the taxi and limousine business for years. 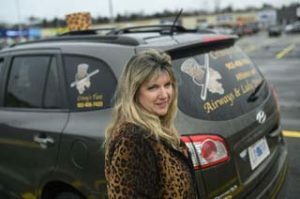 There has been a public demand in recent years for female taxi and limousine drivers in the HRM and Lady Drive Her is here to meet the demand. Contact us today if you are wanting to schedule our airport taxi service in Halifax, NS and the surrounding areas. Lady Drive Her offers pre-booked transportation to and from the Halifax airport. We are made up of a Group of Ladies that would like to offer their Services to the Public, when there is a demand for a Lady Driver, by a Male or Female passenger. We are a Pre-arranged Car Service, offering HRM taxi and limo service to the Halifax airport and surrounding areas. The same Service we have already been providing for years, but now the passenger can request their choice, and hopefully, their demand can be met. Lady Drive Her accepts ALL passengers, Male or Female, and will try to provide this Service as best as we can. The Lady Drive Her’s in this Group, have been in the Taxi and Limousine Business for years, providing airport transportation in Halifax, NS to the Halifax international airport (with a valid Airport Car Service License) and surrounding areas (with a valid HRM Taxi/Limo License). These Lady Drive Her’s are already self-employed, or working for other Companies. The Creator of Lady Drive Her, does not employ Lady Drive Her’s, because these Ladies are already Self Employed. These Ladies are just offering their Services to the Creator of Lady Drive Her, if the Demand is there. The Owner/Creator, Crissy McDow, is already an existing owner of two other Transportation Companies, with Male and Female Drivers that Transport Male and Female Passengers. She has been in the Business over 25 years, serving the HRM as a pre-arranged airport transportation service in Halifax, NS operating to and from the Halifax Airport and surrounding areas. Through the years, Crissy tried to fill the requests from Males and Females, for Female Drivers, but could not always meet the Publics demands due to the numbers. This year, there seemed to be 10 Ladies that said they would be on board, to help fill the personal requests if needed. This idea has been kicking around for years, and finally put into motion, due to support from the other existing Lady Drivers in the Business. They also recognized there was a demand for personal choice. This New Venture was brought on solely because of the demand from the Public. The Public wants choices. If you would like to arrange airport transportation in Halifax, NS contact us today to schedule your request. Self Employed, or working for another Company. There is a waiting list for a Taxi Roof Light. There is no waiting list for an HRM Limousine Car license, but you can not work the HRM Taxi Stands with a Limo. Want to join our Group List of Lady Drive Her’s? Pre-arranged airport transportation service Halifax, NSIf you are arriving at the Halifax Stanfield International Airport, after receiving your luggage, please report your name to the Ground Transportation Booth upon arrival. They are located to the right of the exit doors, across from the luggage carousels. They will direct you to our Vehicle. Note: Not all Lady Drivers accept Debit. also with an option to pay by cash. All payments come with a receipt. When you need to get to the local airport or get from the airport to the city center, hotels, or other locations, count on our efficient and comfortable shuttle service in Halifax, NS. Several years ago, the owner of Lady Drive Her realized that there was a noticeable need for female taxi and shuttle drivers in the area. Copyright © 2019 Ladydriveher. All Rights Reserved.